S tylish, practical and incredibly comfortable clothes from Westside, the fashion house of Tata group, can be a timely, trendy gift. Available in a wide array of vibrant colors like fuchsia, almond blossom pink, stripy ice blue, emerald green, pepper, red, etc., the new Spring Summer Collection range varies from flirty feminine attires to bold geometric prints. For the new-age globetrotters, you can select from Westside’s Globe Trotter collection. The range is inspired by the world traveler and safari influences, and creates the perfect holiday wardrobe. You can select for gifting t-shirts, shirts with turn up, elbow length sleeves and multi-pocket trousers from an exhaustive range. The collection, adorned by metallic embellishments, is available in earthy tones like beige, bluebell, malboro stone and chocolate brown among others. Globe Trotter collection will make a perfect choice for those on the move and traversing the globe. You may also sift through Westside’s exclusive range of Cruise clothing that is inspired by the flavor of French nautical. The Cruise has on offer a range of shirts, crop jackets and high-waist trousers in vibrant colors like royal blue and jade rock green. For those who will love a Hippie Chic look, you may gift summer dresses from Westside’s Hippie Chic collection that brings with it bold paisley and geometric patterns and floral prints in attractive colors, such as lemon drop, mint magic, olive, purple etc. That’s not all. Westside’s Rave collection is a ‘rebellious’ collection that has rock song lyrics, musical symbols, and the bold slogans of the 90’s in fluorescent highlights. To round it up, you may gift accessories like crystal buckle belts, fashionable caps, beaded jewelry and colorful bangles. You can also select from a collection of bags specific for summers like floral print bags, formal office bags or clutches. 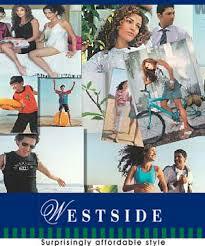 Cool fabrics and vibrant hues Westside’s Spring Summer collection is a perfecting gifting idea in sync with the season! I personally feel that accessories make a better gift than apparel. And I don’t like the idea of giving a gift voucher because it discloses the value of the gift to the recipient-an act which I don’t like. Since the choices of apparel are huge and it is difficult to guess what the likings of the recipient would be, it is easier to gift accessories- for e.g. perfumes or watches or wallets. For father’s day, I would like to give my dad a nice leather wallet or a great looking leather belt. My personal choice is ‘indostyle’ which sells very high quality leather accessories in the latest designs and at affordable rates (a 100% better deal than ‘hidesign’) . The company’s products are only available in Calcutta right now. But I guess given the huge success they’ve had so far, they will soon expand to other cities in India. I do agree that fabric is a suitable gifts for the trendy girls. But todays time the demands of the gifts have been changed because of new trend of life style. They want to give their someone something precious and unforgettable. If you are finding these type of product to gift your someone then visit us…. We are also a e-commerce website. We are the seller of nautical gifts. We have a large range of nautical products. Here we show you some great jordan retro shoes. we offer various air jordan shoes. There are thousands of air jordan shoes on sale on our website.It highest quality, if you buy our jordan retro Shoes you will definitely love those Air Jordans.We are driven by customer service. We believe that because of each and every one of our customers,we are in the position to offer this service for years to come. Our goal isto present the best selection of classic jordan retro 13 available for purchase using a secured payment system. jordan retro.